According to Trend Micro’s PC-Cillin, every website that hosts Google ads from their Double Click network is hosting spyware. 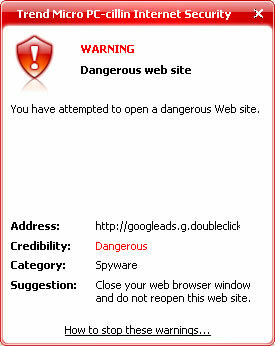 This site (NYTimes) for example invokes the “Dangerous” warning. Boot computer in Safe Mode with Networking. [STEP 2] Run a scan in HijackThis. [STEP 3] Reboot computer in normal mode and turn off the system restore. Observe if the same issue will occur. Update 2: The above was run (an expanded Step 2 is shown below), but the problem still exists. I’ve bounced it back to Trend Micro. Resolved: “Tristan E. Smythe Jr” [I love the stages names they use at Trend :-)] gave me a free uprade to Trend Micro Internet Security 2009 – problem solved! Obviously you’ll need to log a support case with Trend to ensure your serial number is elligible for the upgrade.